I get lots of questions like – are bell sleeves out of fashion? The answer is a straight no! In fact, it is in the top fashion trends of 2018. I have written this guide on Why to wear bell sleeves to How to choose style sleeves to look graceful in 2018. I have also picked my 7 best style sleeves dress/kurti/top which you can purchase to look awesome in 2018. A 70’s fashion look which has been accepted with grace by everyone, and has still been trending. It made a huge come back with so many varieties in it. It’s a very sophisticated style that looks decent for an everyday look. You can wear Bell sleeve at any point of the day it doesn’t have to be the specific occasion to be worn. With whom can you match Bell sleeves? You can wear with pants, shorts, tailored trousers, slim fit jeans, high waist-jeans, ripped jeans. If you are wearing Bell sleeve in kurti you can match it with Palazzo, leggings. Neck- You can wear a black choker to complete the look as black can go with every outfit or long neckpiece. Hands- You can wear a bracelet according to the color combination of your top, kurti, one-piece etc or you can also finish the look with a watch. Hairs- You can wear a hair-band, headband or bandana. And last but not the least way to complete your look is with bold red lipstick, eyeliner, and one coat of mascara to finish with. This color (navy blue/dark blue) is very subtle and can go with any pants or shorts. It’s a high neck top. High necks top are comfortable and there’s no need to wear neckpiece or any accessories it fills the gap with is needed. It’s a must buy for any occasions. You can wear heels, shoes to complete the look. You can buy this top from here. A pink round neck, bell sleeves tops with pearl embroidered are very lees seen tops in the market. They are super comfortable to match with. You can match it with long neck-piece or a choker. This top is worth buying because of their unique pearl embroidery. You can wear sneakers or boot-shoes to complete the look. 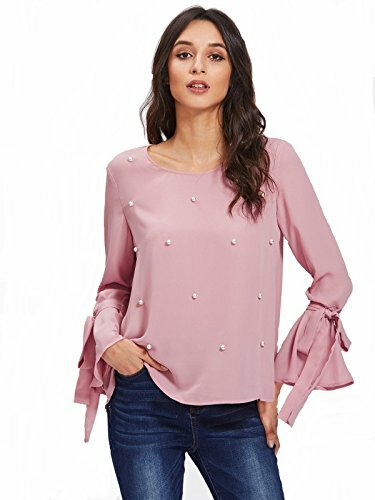 You can buy this bell sleeve top from here. This cotton kurti is comfortable for office going women or for some special occasion. It’s a straight cut kurti which is trending now-a-days, and has given a tint of bell sleeves for some distinct look. Block printed in kalamkari style jhumki. It’s a great buy option for office working women or housewives. You can complete the look with flats or sandals. You can buy this bell sleeve kurti from here. The Bebo Bell Sleeve Crepe Straight Elegant Kurti maroon V neck kurti. It is having a choke neck to make the look unique. This is an indo-western look for kurti and the best match is with palazzo. It’s worth buying because of the unique design for choker look. You can wear pumps or wedge sandals for the final look. You can buy this Bell Sleeve straight kurti from here. Also Read - 10 Best summer dresses you can buy on amazon! A Cotton Viscose material kurti comfortable for any occasion. Hand Block Printed Cut-out Kurta is also in trend and worth buy for various events or festivals. A round neck covers the neck enough, so you can just go with a watch or bracelet to cover your hands. You can wear flats for comfort. You can buy this Bell Sleeve Kurta from here. One Piece Short Mini Bell Sleeve Dress (Blue) with 95%Polyester+5%Spandex. The sleeve is thin net material. This one-piece looks great for party look as it has cute pom-pom at the end of sleeves. The round neck fills the emptiness of the neck. You can wear heels to complete the look. This piece is worth buying for part wear. You can buy this Bell Sleeve Mini Dress from here. One Piece Floral Midi Bell Sleeve Dress is very light to wear for summers. It has a beautiful floral print that makes the dress very cute to wear for any girls or women. You can wear a long blue neck-piece or just leave with nothing. You can complete this look with some heels. If you are visiting the beach this floral one-piece will really match your destination look. You can buy this Bell Sleeve One Piece from here. Do you find the bell sleeves dress pattern comfortable, let us know in the comment section. What Are Green Powders and Why Do you need Them?